This is too good not to share. I have been Pinterest obsessed for some time now, the amount of good recipes, home décor, quotes, fashion inspiration, DIY ideas and everything else you could imagine is limitless. What an inspiring community and I always find something I either want to make, whether it be food or a coffee table, ha! This time, I found a recipe that I could not wait to try! Daarik doesn’t eat soups or chili so I knew I could get away with all the ingredient it calls for and not have to manipulate it for his likings [SCORE]. 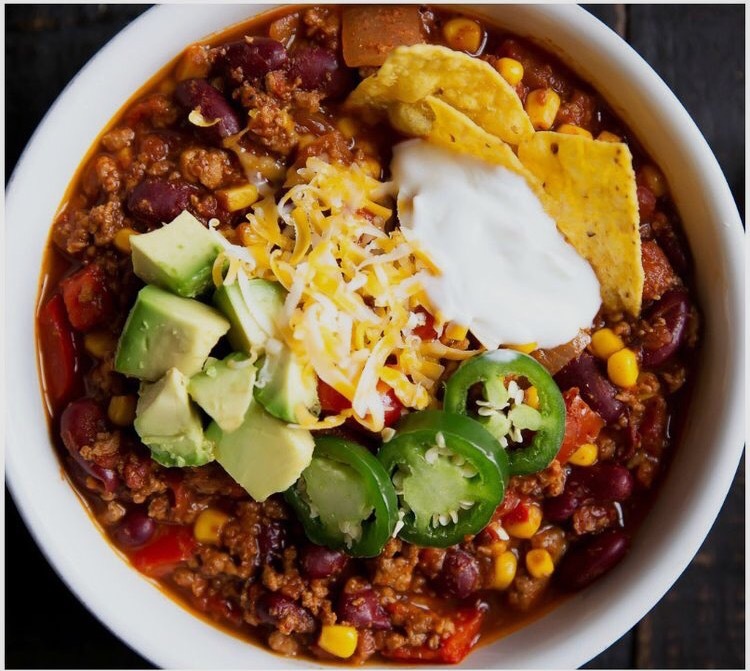 This recipe (and the pic I used because mine wasn’t nearly as pretty) is from Ambitious Kitchen; her blog has sooo many delicious looking recipes and I cannot wait to try more, check her out! As for this recipe, I ended up taking the whole pot down to my mom’s house and shared with her and my sisters….. it was hit to say the least! Place oil in a large pot and place over medium high heat. Add in onion, garlic and red pepper and saute for 5-7 minutes, stirring frequently. Next add in ground turkey and break up the meat. Next add in chili powder, cumin, oregano, cayenne pepper and salt; stir for about 25 seconds. Next add in tomatoes, chicken broth, kidney beans and corn. Bring to a boil, then reduce heat and simmer for 30-45 minutes or until chili thickens and flavors come together. Garnish as you like, serves 6, about 1 1/2 cups each.